I have been growing some native wild plants for microgreen purposes, to expand my palate. I have had pretty all right success (so far) with purslane (cannot believe that this Summer/tropical plant is clinging on, but I still have 3 little 'bushes' left from about 9 over the summer !!!) a crore of Asian garlic-chives and wild garlic (don't worry: it 'stinks' like garlic, so that means it's edible), a bunch of surprisingly doughty thistle seedlings (by far the best-tasting of my asteraceæ inulin-slaves), dandelion seedlings, wiry mint plants, and some daikon that I let go more to root (I hœp). But I have had nominal success (despite a fungus/white mold attack) with Burdock/gobo. They grow quite strong and the leaves are quite big and tender, but are by far about 20x more bitter than the bitterest dandelion greens I've ever prepared. I tried a trick I use with dandelion greens, but with a slightly different twist. The trick is to prepare the greens with bacon fat - salty, luscious, creamy bacon fat. Sonething about the porky naughtiness just neutralizes the bitterest principles of the dandelion, and makes for a truly yummy, hearty worthy late fall/winter veg. But today, seeing as to how I had some bacon laying about from yesterday's brunch kitchen explosion, I wrapped some sticks of bacon in fresh-snipped burdock leaves. lettuce or simply ramped up arugula: you have to appreciate it for it's own untamed, indomitable mustang-merits. But if yer brave enough, give it a try. BTW, I would not use the bigger more prominent leaves on a burdock/gobo crown: god only knows what sort of paint they'd taste like. I also recently bought some gobo root from the local Asian grocery: cannot wait to make some Kenpira Gobo stir-fry once againe!!!!! @Lambuzhao you probably already know, saltiness is the usual antidote to bitterness. I’m jealous you got your kitchen garden to succeed. How? I'm at least as surprised. Up til now, my greenthumb seemed to be only for outdoors. Normally, keeping plants in my doors was an instant, irrevocable death sentence. Well, on reflection, since these plants are being grown for slaughter , I guess the same holds true. It's just a prolonged sentence, now. Youtube helped a lot. Did a lot of research there and on the 'Net to see what the next stages of each species' plantlets would be (over the summer). Putting them almost all in Southern/Western exposure provides plenty of light, which helps a whole lot. Not overwatering helped next to most. The biggest help is that the microgreens, even the 'milquetoast' vegetals, were selected for nutrition but also durability. I am growing crucifers (radish, daikon, turnip) which spring up almost immediately, provide ample microgreens, and have a tasty peppery bite welcome in sammiches & salads & garnishes, & whatever else. Asian chives and mint are a little higher maintenance, but provide a lot of flavor. I planted the leftover roots of about two bunches worth of regular store-bought scallions. That was in August, and each plant is still regularly pumping out one new spike per week. After that, all my other kitchen herbs are wild things: Purslane (still growing ?!) was dug from neighbor's yards, and weeded by my son from his mom's yard. Burdock/gobo seeds, Curly Dock seeds, Queene Anne Lace (NOT Poison Hemlock! )t seeds, Milk & Nodding Thistle seeds, Dandelion seeds were all harvested locally. Though their initial growth was sketchy~weedy, they have slowly proved their worth as marathon-running junkyard dawgs with regard to endurance (and my itchy kitchen-shears ). Also, I cannot grow most in the kitchen. I have one tiny sill with a somewhat blocked Eastern exposure. That's the perch for the Gobo plants alone. So, fluctuations in heat/chill where I grow the rest maybe helping them. Again, the dandelions, gobo, alliums, crucifers kind of prefer it chilly, anyway. Also, some are a test in patience. I have had great success with wild garlic bulbils. And their tender baby spikes are a pure treat compared to the 'wolfy' taste+überaftertaste of the fuller grown, outdoors spikes. My indoors Wild Garlic are a cascade of very thin, lacy green. But they took from July to September to germinate and finally sprout. Was it worth it? Heck YES! All are grown in a mix of about 1/2 seedling starter soil mix, and 1/2 sand. I put pebbles in the bottom for drainage. No containers have drainage holes. As for containers, I use little $1 store plastic rectangular pencil/pen (??) trays. Some are still growing in larger plastic half-sized windowsill boxes. We live & we learn. I was going to thank everybody for all those posts, then I realized they’re all Lambuzhao! Lambuzhao, the inside of your house must be a veritable Garden of Eatin! Our indoor greenery has, for the last several years, consisted of several citrus trees (lemons or limes or maybe both), an avocado tree and a (I forget the English name) gumumela. No fruits as of yet: trees are too young I think. Also an ancient geranium and an ancient shamrock. Light, of course, is of concern this far north. Especially for relatively tropical plants. Have been considering a supplimental light source to be used a few hours each day. This year we also inherited some kind of random doctor's-office-tree-with-long-spiky-leaves. "Locked in his chamber, he worked on a prototype. With prisms and lenses, he built an interworldly vision. Stuck on the other dimension. Will he see his friends once again? With his eyes, he sees the prismmaker lens. Through the lenses, they still see." But do you recall . . . The pres who drove on alcohol? You're the one who'll save us all!" Would soon collude with Russians? Would shut down all discussion? Did you know your baby boy 'gainst Ted Cruz would compete? Would raise crime if you want crime? Would build a wall you can't climb? Did you know your baby boy would be a sexist clod? Make Clinton's flaws seem littler? Would get compared to Hitler? Did you know your baby boy might even nuke Iran? Who is a bold, brash billionaire? Trump is a bold brash billionaire! Who always talks, but is full of air? Trump always talks, but is full of air! Must be Donald, must be Donald, must be Donald, Donald Trump! Who's got a toupee on his head? Trump's got a toupee on his head! Who knows Ted Cruz as Lyin' Ted? Trump knows Ted Cruz as Lyin' Ted! Who says he'll make this country great? Trump says he'll make this country great! Who sure knows how to bloviate? Trump sure knows how to bloviate! Who married thrice and often cheats? Trump married thrice and often cheats! Who gets online and tweet, tweet, tweets? Trump gets online and tweet, tweet, tweets! Who's as rich as Ebenezer Scrooge? Trump's as rich as Ebenezer Scrooge! Who's got an ego that is yuge? Trump's got an ego that is yuge! Whose reign is filled with coverups? Trump's reign is filled with coverups! Who's living proof that power corrupts? Trump's living proof that power corrupts! Must be Donald, must be Donald, must be Donald, Donald CHUMP! 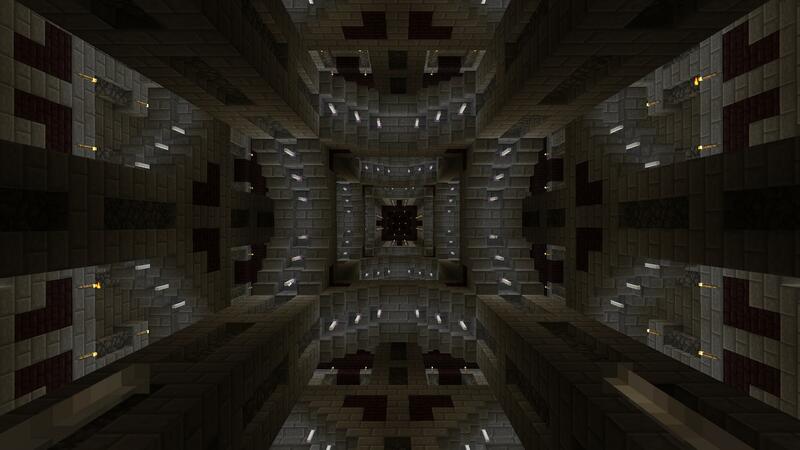 But has ended up becoming a much larger build, currently around 1000 blocks by 1000 blocks. The stone (grey) and just paths, unless they have spruce (brown) running through them, in which case they're walls of various thicknesses and heights. There are four main baileys through which a path runs (each bailey, as well as the structure as a whole, having a single entrance), which are divided by the thickest walls. The two outer baileys on the left of the map are then further divided into three smaller (sub-)baileys by slightly thinner walls, while the thinnest set of walls runs alongside the "inner" edge of the main pathway (well, mostly) basically just to keep movement from the main path to the wall around the centre bailey just a bit more difficult (I'd call it a "redundant wall", in that they're there "just in case" more than anything else). 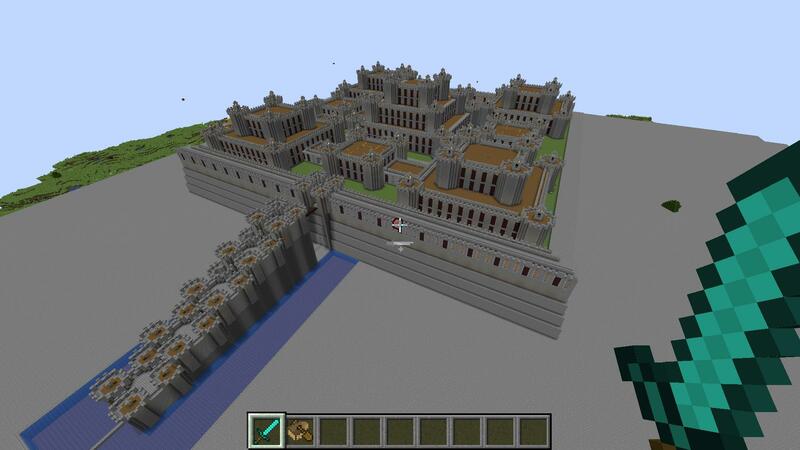 The main "castle" structure (bottom right) then has its own internal bailey system, as well as a set of barracks outside its entrance (I think there's 200 beds there altogether, as well as bathhouses, mess halls and map rooms). 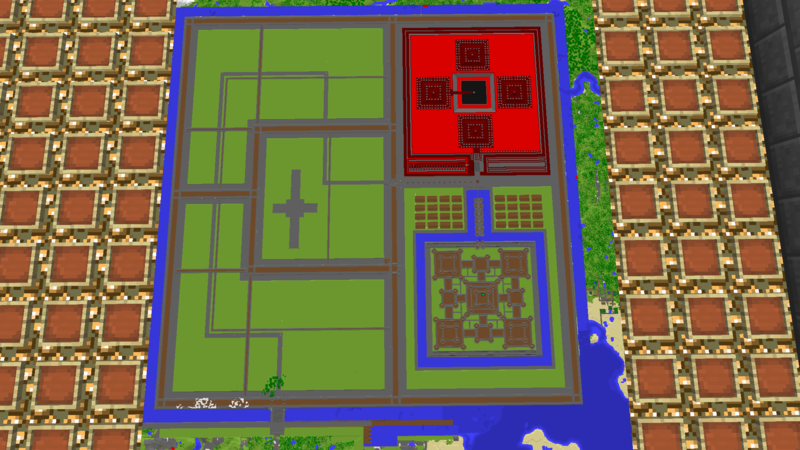 I'd call it a fortified town more than anything else, and the plan is to fill out the various baileys with houses, stables, forges, religious buildings (the structure to the top right is basically just a glorified nether portal at the moment, but I want that to be a sort of ritual site as well in the end), food storage areas, etc. Oh, and there's a small harbour at the bottom of the map as well, to the right of the town's entrance. 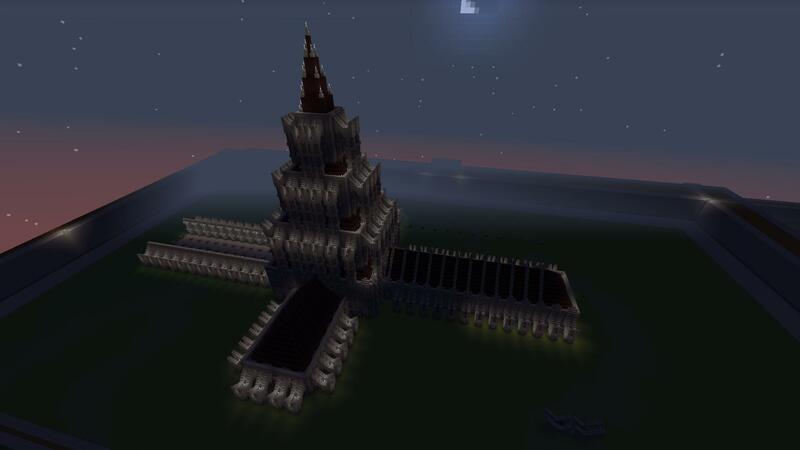 I've intentionally gone heavily overboard on the flying buttresses, since I think it gives it a more... industrial(?) look. Like, from a certain perspective it looks almost like a factory. Which I really, really like.